Apple’s latest 2019 iPads are now available to buy, and we’ve run them both through our tough lab tests to find out whether they’re worthy additions to the range. Here are the latest models along with all of the current iPad range, plus five cheaper alternatives. With five different current-generation iPads available to buy, Apple’s range of tablets is now the biggest it’s ever been. That’s great for choice, but also means you have to think a little more about what you want from your next tablet. Do you want something just for reading magazines and books? watching the latest films and catching up on BBC iPlayer? A fully-fledged laptop replacement? 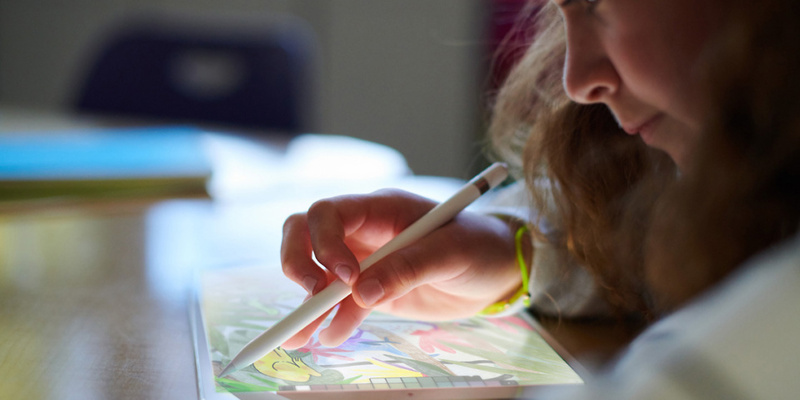 The answers to these questions will define which iPad (or iPad alternative) you buy. Browse all our tablet reviews to find the perfect model. The very latest models have been through our test lab to see if they’re up to Apple’s high standards. 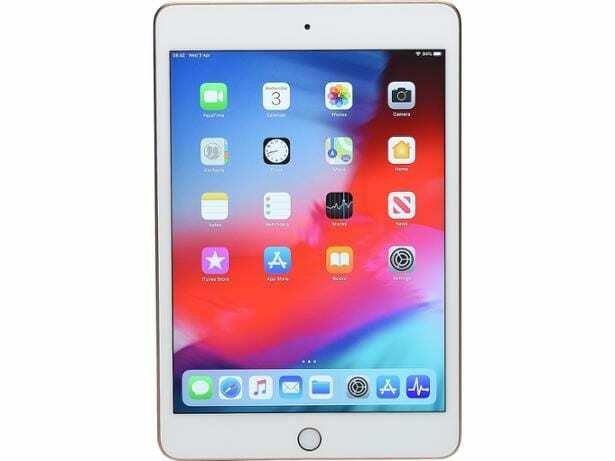 The smallest iPad you can buy, the 7.9-inch Mini was updated in March 2019 with a new processor (the Apple A12 Bionic seen on the iPhone X) and screen. Prior to that, the iPad Mini had last been updated in late 2015, which made it one of the oldest ‘current generation’ Apple products on sale. The Mini’s small size and light 298g weight means it should be the ideal commuter companion, and particularly adept at replacing books or an eBook reader. Its 2,048 x 1,536-pixel screen with Apple’s latest True Tone technology should also make it ideal for viewing magazines packed with images and text. Read our full iPad Mini 2019 review to see if the upgrade has been worth the wait. A cheaper alternative: Amazon Fire HD 8 2018, £80. It might seem silly to rank these two tablets in the same category, but in terms of size and weight they’re both targeting a space in your satchel. The Fire HD 8 is unlikely to boast the same screen and sound quality as an iPad Mini, but if your needs are basic – for instance you only really want to read ebooks and occasionally browse the web and aren’t fussy about video quality – you can save a wad of cash. See our full Amazon Fire HD 8 2018 review for more. This is a brand-new product, despite it sharing a name with tablets that were released five years ago. It’s now the largest iPad that isn’t a Pro model, the Air has a 10.5-inch screen, giving you plenty of extra space over the standard 9.7-inch iPad. Despite the extra size, it’s actually lighter than the £319 iPad. 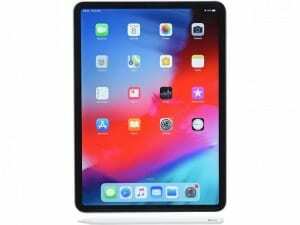 It also features a magnetic keyboard connector in a similar vein to the iPad Pro, which means you can connect a keyboard case to the iPad Air without the need for Bluetooth and batteries. This could make it the perfect choice for those who don’t want to spend the extra money on an iPad Pro. There’s also an Apple A12 Bionic processor, as with the iPad Mini. 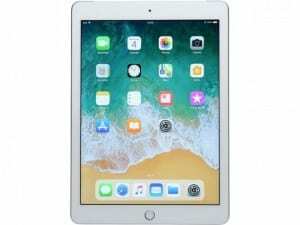 Read our full iPad Air 2019 review for more. A cheaper alternative: Samsung Galaxy Tab A 10.5, £250. This mid-range model from Samsung should tick plenty of boxes thanks to its high-resolution screen, speedy performance claims and Dolby Atmos-branded speakers. It also has a magnetic keyboard connector, like the iPad Air. Read our full Samsung Galaxy A 10.5 review for the full verdict. The cheapest iPad you can buy. It doesn’t boast the same impressive specs as the Air and Mini, but if you want a new iPad, this is the easiest way in. Our full iPad 2018 review reveals whether it’s actually a better option over the new models. A cheaper alternative: Lenovo Tab 4 10, £170. A little larger than the iPad, but you get plenty of tablet for your money. If you’re after an iPad alternative for browsing the web while sitting on the sofa or in bed, this could be an ideal choice. Read our full Lenovo Tab 4 10 review to make sure. 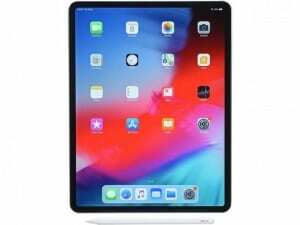 This iPad is verging on laptop territory here, with a large screen, powerful internals and high-tech display along with support for the latest Apple Pencil stylus and Smart Keyboard connector. Read our full iPad Pro 11-inch review to see if it justifies the price. A cheaper alternative: HP Envy x2, £689. Slightly larger, but this Windows 10 tablet comes with a keyboard and stylus in the box along with 4G connectivity. Our full HP Envy x2 review reveals all. If the 11-incher was verging on laptop territory, the iPad Pro 12.9 has mounted a full on invasion. It’s huge, and features the same high-end specs as its smaller sibling. You’ll get the most from it if you buy the Apple Pencil, Smart Keyboard, or both, but you’ll be spending well in excess of £1,200 if you do so. Read our full iPad Pro 12.9-inch review to see if it measures up. A cheaper alternative: Microsoft Surface Pro 6, £870. This Windows tablet is slightly smaller, but it features familiar, laptop-like specifications including an Intel Core i5 processor and 8GB of Ram. It also runs Windows 10, which may be more familiar if you’re transitioning from a Windows laptop. Read our full Surface Pro 6 review to see if Microsoft can one-up its rival. Is it worth paying more for an iPad? 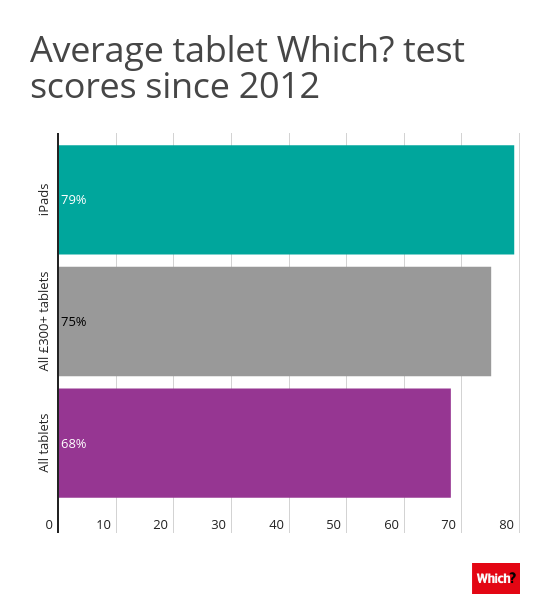 Our exclusive lab test data shows that iPads over the years tend to perform better than the average tablet, and slightly better than many other premium tablets costing more than £300. Our tests date back to 2012, and since when we’ve tested over 200 models. So while Apple does have the edge in average scores, the closeness of the fight between it and other brands means there is a lot to be said for considering what you want your tablet for. Apple products aren’t cheap, so checking our trusted, expert reviews can help you find more than adequate alternatives that could save you money. For more on Apple’s popular range of tablets, read our guide on which iPad to buy. Which Samsung Galaxy Tab should I buy?